Project co-investigator Dr Karen Masters has presented the findings of VOLCROWE research into the science learning and the success determinants of online citizen science projects at the International Astronomical Union General Assembly in Hawaii. The IAU General Assembly is a highly prestigious meeting of leading minds in astronomical research from around the world. Dr Masters’ participation in the event during August 2015 has played a key role in communicating the findings of the VOLCROWE project to a wider audience with an interest in science education and communication. A full copy of the presentation from the conference can be donwloaded here. (Photo courtesy of Andrea Bernagozzi). A working version of a study by the VOLCROWE team into the motivations of Zooniverse users is now available online via SSRN. 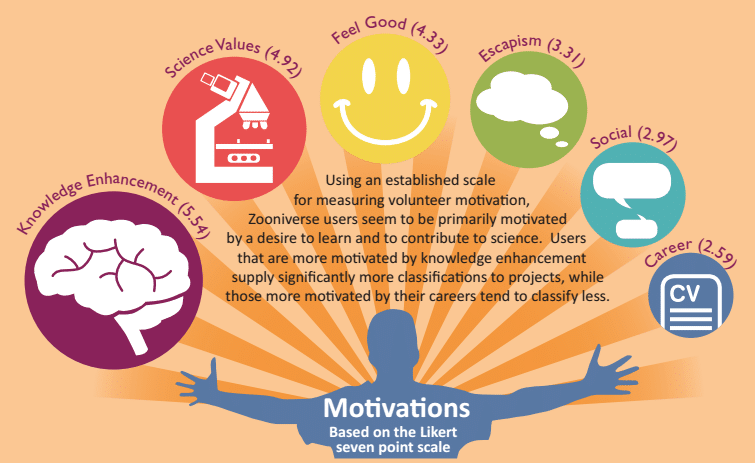 The study investigates motivations to volunteer for Zooniverse projects and the relationship between these motivations and levels of participation. The study uses survey data from a representative sample of Zooniverse users across five projects (Galaxy Zoo, Planet Hunters, Snapshot Serengeti, Seafloor Explorer and Penguin Watch) and measures motivations using the Volunteer Functions Inventory (VFI). These measures are subsequently used to model individual-level variations in contributions to these projects. The study finds evidence that the ‘undertanding’ motivation (i.e. learning) is the most significant determinant of variations in contribution levels – in other words, those who want to learn more tend to contribute more classifications over longer periods. As well as acessing the study via SSRN, you can also download a copy of the paper directly from the VOLCROWE website here. 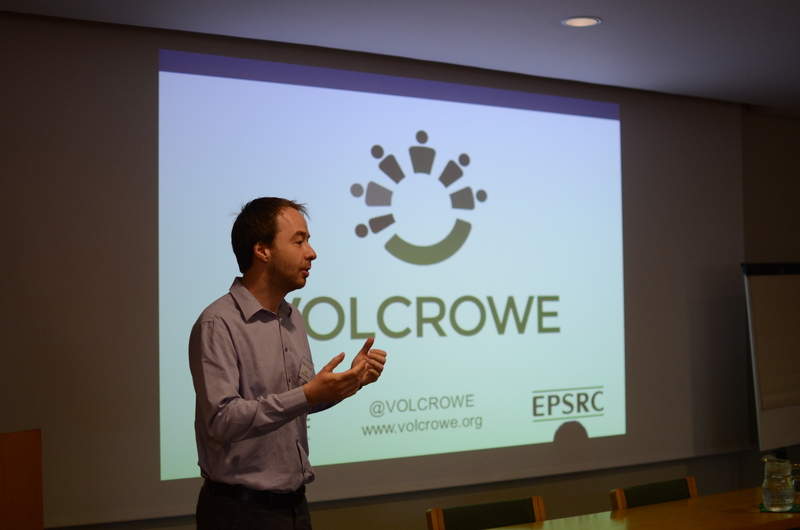 The VOLCROWE project recently featured as part of Crowdsourcing Week event. The event was established in 2012 and has resulted in a series of global conferences and summits which bring together thought leaders from around the world to engage and discuss how crowdsourcing can lead to meaningful change. As part of VOLCROWE’s involvement in the event, we contributed a Crowdsourcing Week blog explaining the objectives of the project and our findings to date. We also produced an infographic sheet summarising our main findings in a visually engaging way. Our research on this project is increasingly pointing to Zooniverse and Citizen Science Volunteering as being driven by knowledge creation. We show that the opportunity to enhance knowledge and understanding is a primary motivation of Zooniverse volunteers and one which associates the most strongly and positively with classification activity and sustained engagement. You can read the Crowdsourcing Week blog here and download a copy of the summary infographic here. New VOLCROWE Publication: How is success defined and measured in citizen science? An article authored by the VOLCROWE team has recently been accepted for publication in an upcoming special issue on citizen science in the journal ‘Computing in Science and Engineering‘. The paper is entitled ‘How is success defined and measured in citizen science? A case study of Zooniverse projects’. The paper develops a set of novel measures of successful project outomes in citizen science under the headings of ‘contribution to science’ and ‘public engagement’. We then apply these measures to a number of Zooniverse projects to assess the extent to which the various projects have been successful in meeting these objectives. The paper concludes with refelections as to the reasons why certain projects have been more successful than others, as well as presenting a set of managerial implications and recommendations for the Zooniverse and practitioners of citizen science more generally. A link to the post-print version of the paper can be found here. As part of the workshop on Volunteering and Altruism in the Digital Economy run by the VOLCROWE team in Oxford in April, a number of issues and research questions of mutual interest to those in attendance were discussed and recorded. These have now been written up in the form of this VOLCROWE Volunteering and Altruism in the Digital Economy Workshop Outcomes document, which groups the issues and research questions into a number of key thematic areas, including finance, community and data. The questions and issues highlighted in the document serve to highlight where research efforts are most needed, we well as many areas of potential collaboration between academic teams working in the area. For example, the VOLCROWE project is committed to tackling several of these issues in areas such as management and gamification. The document has been distributed by e-mail as part of the formation of a network of academic and practitioners in attendance at the Oxford workshop with a shared interest in digital volunteering and altruistic behaviours. Please contact the VOLCROWE project team if you would like to join and receive e-mail notifications from this group. 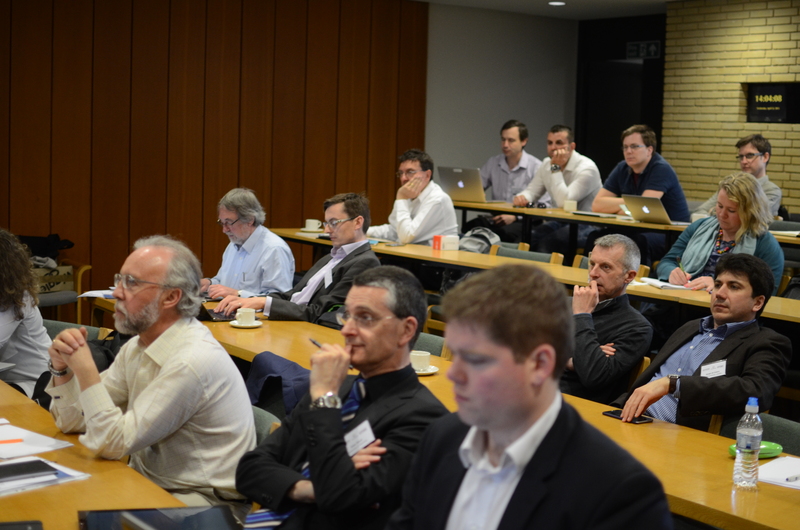 The VOLCROWE team has successfully hosted an event on 22nd April, 2015 at the University of Oxford bringing together academic and practitioners working in the area of volunteering and altruism in the digital economy. A varied and interesting range of contributions were made by organisations such as NESTA, Cancer Research UK, Just Giving and the Zooniverse. Academic research teams also contributed information about their activities, with contributions from the VOLCROWE project, the CENTRIM newtork at the University of Brighton, the Communities and Culture Network + and other streams of research funded by the NEMODE network. The day culminated with a lively group discussion of overarching issues and the development of a shared research agenda highlighting the most interesting issues and research questions going forward. A link to some of the materials captured on the day can be found here. The VOLCROWE Team, in association with NEMODE and other Network+ Groups, will be running a one-day workshop on volunteering and altruism at St. Catherine’s College, University of Oxford during the afternoon of 22nd April 2015 (1pm – 5pm). The workshop aims to bring together academics, researchers and other interested parties to share ideas, evidence and policy relevance of research into volunteering and altruism and the impact of the digital revolution on these processes. Attendees at this multidisciplinary workshop will be able to share and learn about alternative perspectives on volunteering, including the motivation to volunteer, the impact of volunteering, the notion of civic society and ways in which digital volunteering might lead to widening participation in the voluntary sector. The event will also explore theoretical and empirical research into volunteering, as well as the evolution of a shared research agenda that would foster future inter-disciplinary collaboration. There will be ample opportunities to network and learn about other streams of research being undertaken in this field. In attendance will be representatives from NESTA’s Innovation in Giving Fund, as well as Cancer Research UK, who have made innovative use of online crowdsourcing and gamification to encourage contributions to the battle against cancer. They will be talking about the ways in which the digital economy has fundamentally changed the way that people can volunteer their time to help with worthy projects, as well as some of the challenges and key questions they have faced when innovating in this way. In addition, members of the VOLCROWE research team will provide an insight into the economics of volunteering in the digital economy. The VOLCROWE team hosted ‘ZooCon Portsmouth’, a successful public event in collaboration with Wikipedia held at the University of Portsmouth. The event brought together a group of volunteer contributors from the Zooniverse platform (www.zooniverse.org) to reflect on the profile of citizen science on the web and how it was being represented on sites such as Wikipedia. With guidance from Wikipedia representatives, attendees then participated in a ‘Wikithon’ where the Wikipedia entries for citizen science and Zooniverse projects were collaboratively reviewed and updated live at the event. Attendees also received training on how to continue revising and updating such entries in the future and took part in a series of one-to-one interviews with researchers on the VOLCROWE team regarding their motivations for participating in citizen science projects. As a result of the Wikithon, it became clear that the current rules regarding image use adopted by Sloan Digital Sky Survey (SDSS) are preventing use of the images on public websites like Wikipedia. The Executive Board of the SDSS is now in the process of responding to a formal motion to revise the rights for image use to allow for more general usage. All signs are positive that a change of policy will result from this activity and the images from this survey will be made more widely available to the general population as a direct result of this event.